In its April sale of baseball collectibles, Heritage Auctions of Dallas, Texas, withdrew two letters written by Hall of Famers Joe Tinker and Fred Clarke after it was brought to their attention that the letters appeared to be missing from a file of the August Herrmann Papers archive at the National Baseball Library in Cooperstown, NY. Last week Heritage removed another letter suspected to have originated from the same Hall of Fame files; a 1913 letter to August Herrmann from Chicago White Sox owner and Baseball Hall of Famer Charles Comiskey. Scheduled to be sold as lot 41095 in their Sunday July 4th internet auction, the letter, dating from October of 1913, appears to have originated from “Box 52, Folder 26″ of the August Herrmann Papers archive. 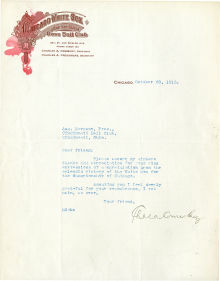 Folder 26 includes all correspondence from Comiskey to Herrmann from 1911 to 1914. The Herrmann Papers collection, donated in 1960 by Cincinnati Reds owner, Powel Crosley Jr., includes Reds owner August Herrmann’s entire files of correspondence (over 40,000 documents) spanning from 1902 to 1927. The treasure trove of documents remained uncatalogued in boxes for decades at the Hall of Fame until a recent grant provided for the proper conservation and catologuing of the important collection. Although access to the collection was limited over the years, suspicious correspondence addressed to August Herrmann has been appearing in private and public sales since the early 1990’s. In 1988 reports of alleged thefts from the Baseball Hall of Fame and the Herrmann Papers collection were the subject of an apparently unresolved FBI investigation. 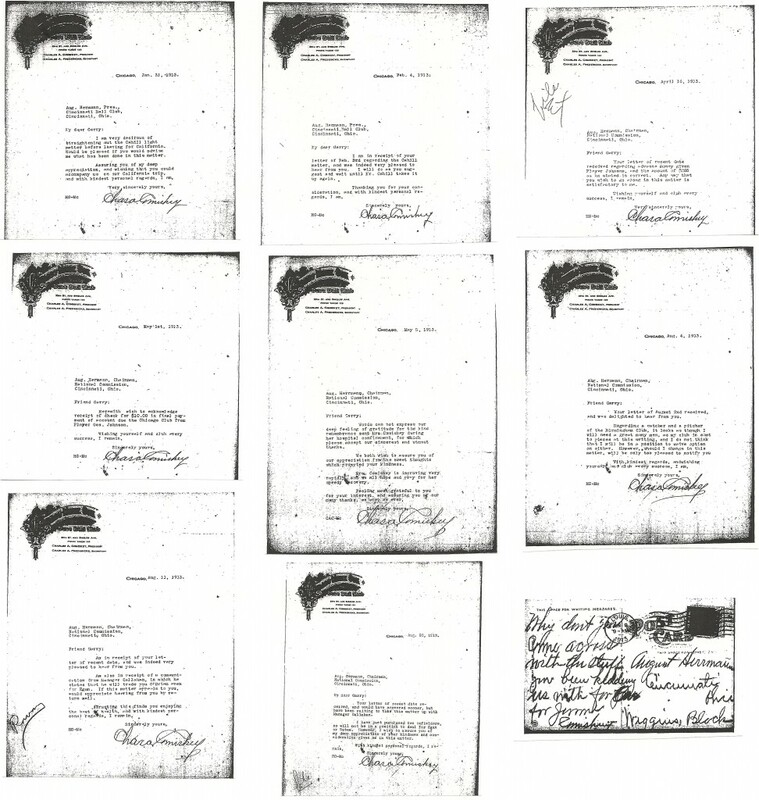 Since that time the baseball collectibles marketplace has seen a wide array of Herrmann-related documents suspected to have been stolen from the Cooperstown shrine. 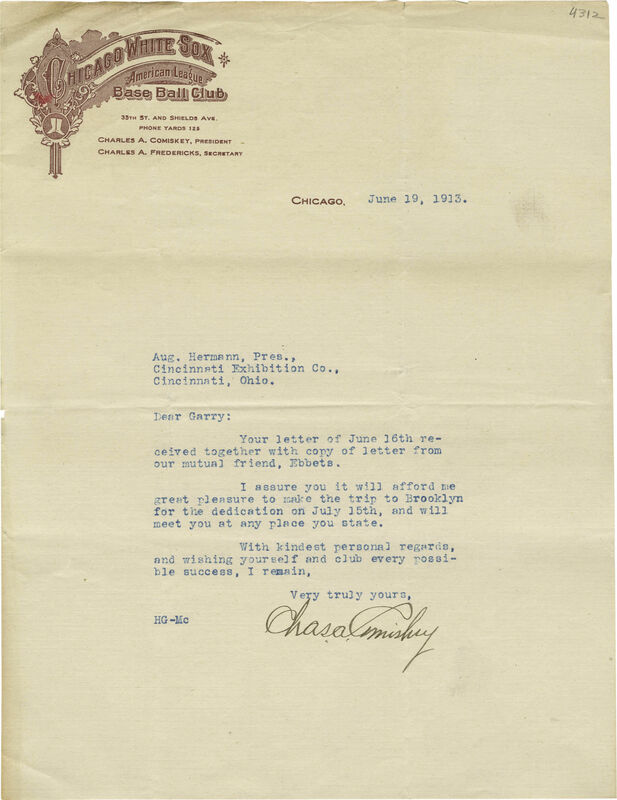 Heritage Auctions also offered and sold another 1913 Charles Comiskey letter to Herrmann in their May 2007 auction. When notified by haulsofshame.com that the 1913 Comiskey letter was likely stolen from the Hall of Fame‘s collection, Heritage’s Sports Auctions Director, Chris Ivy, responded via email stating, “We will remove the lot from the auction.” Ivy was able to review the remaining contents dating to 1913 in the Hall of Fame’s Folder 26 from Box 52 of the Herrmann Papers archive. Remaining in that file are eight letters (and several postcards) from Comiskey to Herrmann from the year 1913. Nowhere in the Heritage Auctions lot description was it mentioned that the Comiskey letter was addressed to August Herrmann. In addition, the letter was accompanied by a letter of authenticity from James Spence Authentication, stating that the document bore an authentic Comiskey signature, even though the letter clearly displays a secretarial signature of the famous White Sox owner. Brad Horn, the director of communications for the Baseball Hall of Fame declined to make any statement regarding the Heritage letters and the alleged thefts. He also declined to answer queries as to whether the FBI had reopened the investigation into the thefts, which dates back to 1988. New Jersey auction house, Robert Edward Auctions, also withdrew three lots suspected stolen from the Hall of Fame in their recent May auction. Several affidavits signed by Chicago Cub players in 1908 were alleged to be part of the August Herrmann Papers archive and a collection of 19th century Boston Base Ball Association stock certificates were suspected to have originated from their Frederick Long Papers collection. A third item, a rare 19th century cabinet card of Hall of Fame pitcher Mickey Welch was also removed from the May auction. The Hall of Fame has photographic evidence of the exact same Welch cabinet card being documented in its collection years before the theft. Horn and the Hall of Fame also declined comment on the items withdrawn from the New Jersey auction. Jim Margolin of the Federal Bureau of Investigation’s New York press office could neither deny nor confirm whether the Hall of Fame thefts were the subject of a current investigation, but did direct further inquiries to the FBI’s public affairs department in Albany. The upstate New York office of the FBI in Albany has jurisdiction over any investigation related to the Hall of Fame. Reached in his Albany office the FBI Chief Division Counsel, Paul M. Holstein, stated he was checking into the status of any open investigation regarding the Baseball Hall of Fame. In the past I always thought auction houses checked carefully into the provenance of every item they accepted for sale at auction. Now I know better. They could not be checking as they should, or these problems would not keep reoccurring. Yet another discovery! This website in my view is most important. In a sense it can be viewed as the baseball aution industry’s watch dog, at least when it comes to early documents, which are of course of most value from a 19th century baseball research point of view. I think that the FBI needs to zero in on whom, in the past, had access to so many of these archives. I think that ultimately, they could find a common thread and person. Keep on this stuff…FBI does need to go after this stuff. Great work, keep the information coming. The original version of this article incorrectly stated that the Comiskey letter to August Herrmann was to be sold as Lot 41095 in Heritage Auction Galleries June 13th sale. Lot 41095 was originally scheduled to appear for sale at auction on July 4th. Poseo una Obra con la firma de A. Herrmann.(1851?) la misma tiene el retrato de Jesucristo. Alguien me podria dar mas informaciòn o asesorarme donde averiguar en Argentina.